Kroger stock is tumbling after worse-than-expected fourth-quarter earnings. Is it a safe stock to buy or one to avoid? Shares of Kroger (KR - Get Report) are on the move, but not in the way that bulls want to see. Shares fell 9.93% to $25.61 on Thursday after the company missed on earnings and revenue expectations. The report is certainly disappointing, but the damage is reverberating through the charts. To put it simply, the technical damage in Kroger is notable. Let's take a look at how to trade the plunge in Kroger stock. It was clear that Kroger stock was locked in a downtrend (purple line), as shares were squeezed lower and lower against its major moving averages. Admittedly, KR stock was putting in a series of higher lows as well, but the warning sign came Monday. Amazon (AMZN - Get Report) announced its grocery store ambitions, hitting stocks like Kroger and Walmart (WMT - Get Report) . While it will take some time for Amazon to make a notable dent in the grocery industry, it nonetheless hit the stocks. Kroger quickly fell below all of its major moving averages, and even though it closed off the lows, couldn't reclaim its moving averages in that session. Although KR stock made a quick recovery back over its major moving averages in the ensuing sessions, the rally stalled near $29 before Thursday's plunge. Now what? It's promising to see that the Kroger stock is bouncing noticeably off the 61.8% Fibonacci retracement of its two-year range. Where it goes from here is a bit more puzzling, though. On the plus side, longs now have a level to measure against, that is, Thursday's low and the 61.8% retracement level. Below that and more downside to $24 and likely beyond is on the table. However, if Kroger stock can continue to bounce, a run north of $26 is possible. From there, shorts may find the risk/reward setup enticing, as a close over prior support could act as their stop-loss. 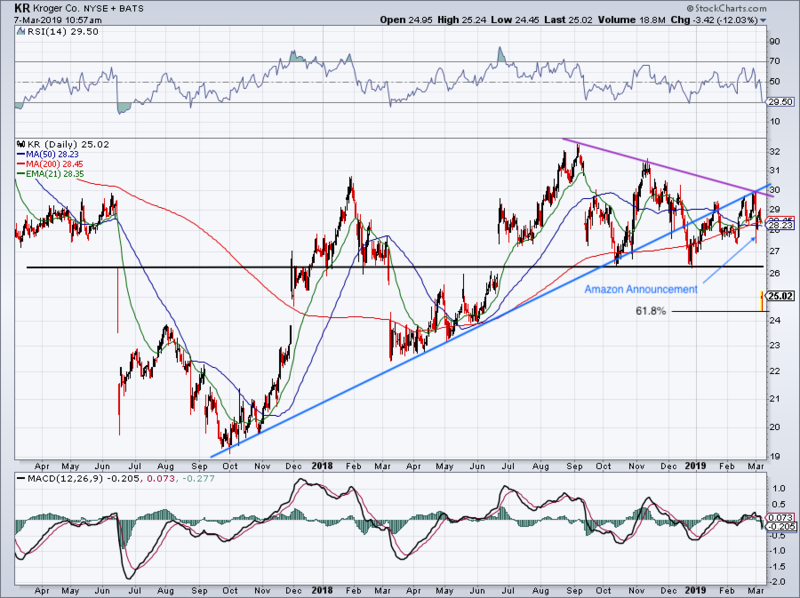 However, if that prior support (near $26.25) becomes resistance, Kroger stock could have more downside ahead. After a quarter like this, it's no wonder why bears would be lining up to sell this stock at a favorable point. GAAP earnings of 32 cents per share missed estimates by 22 cents, while non-GAAP earnings of 48 cents per share came up 4 cents short of consensus expectations. Revenue of $28.09 billion not only missed expectations by more than $300 million, but also contracted 9.5% year-over-year. Margins were under pressure as well, while the midpoint of management's outlook came up short of consensus expectations. It's not a great situation at Kroger right now, and as such, it's hard to be a buyer.